As a physio you build a strong relationship with every patient who has to go through an ACL rehabilitation. You’re there for her/him every step of the way. So you better know everything there is to know, starting from rupture and surgery to return to sport. This course will discuss the challenges relating to the rehabilitation of athletes after ACL reconstruction and the use of biomechanics to improve the rehabilitation process and provide accurate data to assist in return-to-play (RTP) decision making. It includes loads of practical stuff, that can be used immediately in your professional setting. – Identify all the factors that need to be assessed and addressed throughout ACL rehabilitation and how they interact with and influence each other. Doelgroep van de cursus :Kinesitherapeuten, sportkinesitherapeuten, manueel therapeuten, osteopaten en artsen. Enda King (PhD) is Head of Performance Rehabilitation with Sports Surgery Clinic, Dublin, Ireland. His role focuses on combining the use of 3D biomechanics and individualised high-level residential rehabilitation to optimize recovery from injury and enhance athletic performance. He has worked with athletes across a wide variety of disciplines including rugby, football, AFL, NFL, UFC, boxing, horse racing and GAA. His greatest areas of expertise lie within knee/ACL rehabilitation as well as athletic hip and groin pain and is widely published in peer reviewed journals in both areas. 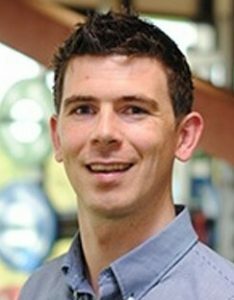 Enda has recently completed his PhD on the use if 3D biomechanics in ACL rehabilitation through the University of Roehampton, London and will share much of his new research and clinical developments on this course. Niet op voorraad! ACL Rehab - 26-27sept19 €490,00 50€ (excl btw) cateringkosten inbegrepen in vermeld bedrag.